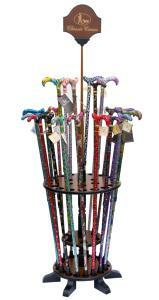 Brown circular display stand, holds 24 canes over two tiers. Requires floor space 26" (66cm) in diameter to allow for fanning out of canes. Overall height of stand 70cm, not including logo pedestal. Diameter of each hole: 45mm. PLEASE NOTE, WE SUBSIDISE THE PRICE OF THIS STAND. IT IS FOR RETAIL USE ONLY AND IS NOT FOR RE-SALE. 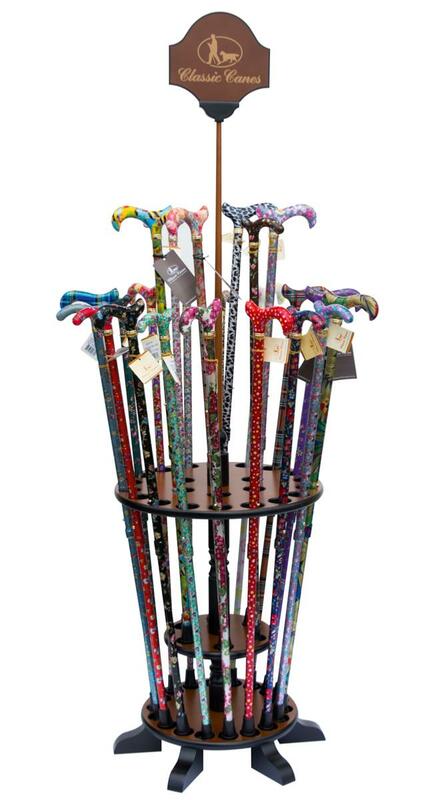 IT IS SUPPLIED ON THE CONDITION THAT IT IS USED FOR THE DISPLAY OF CLASSIC CANES PRODUCTS ONLY. NB Subsidised display equipment cannot be used to make up carriage paid orders, thank you.